Ireland is one of the most open, globally connected countries in the world. As the European location of choice for many for the world’s biggest companies – Google, Apple, Facebook, Pfizer, GlaxoSmithKline to name a few –access in and out of the country has never been easier. A crucial consideration for time poor business people. Its geographic position and membership of the EU and the Euro make it an excellent base from which to access the US, UK, Europe and the Middle East. Combined with the great reputation that Irish companies enjoy internationally, it’s a compelling reason to base your start-up here. 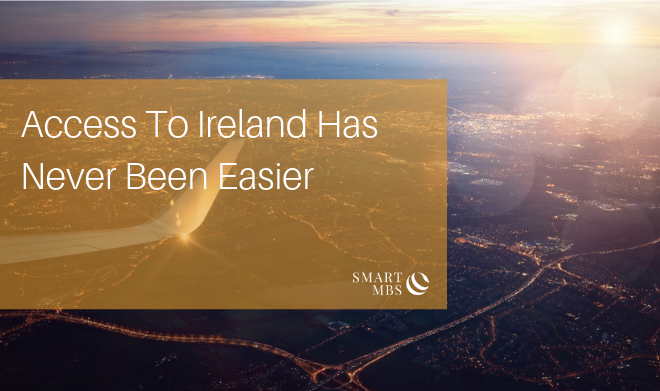 Flights from Ireland and the USA are shorter and more frequent than from any other EU member state. This year, low-cost, long-haul carrier Norwegian Airlines, who recently opened a new base at Dublin Airport, announced plans for continued expansion of their transatlantic routes. Their new US routes from Cork to Providence and from Dublin and Shannon to Stewart International Airport in upstate New York, and to Providence's TF Green Airport further expand on the wide range of direct flights already offered by Aer Lingus, Continental, American Airlines and Delta. This development as well as the recent announcement of direct flights from Dublin to Dallas, Texas illustrate the increasing demand for transatlantic travel. Along with a new €16 million transfer hub catering for connecting passengers, the Texas route will be Dublin airport’s 24th North American destination. A huge benefit for Irish based companies is the fact that US customs and immigration can be pre-cleared both in Dublin and Shannon. This means you avoid immigration queues on arrival and literally pick up your bags and go once you land. If you have an onward connection in the US, you are effectively treated as a domestic arrival – saving you valuable time. Our membership of the EU and the Euro ensures companies based here have excellent access to a sophisticated market of over 500 million people and 28% of global GDP. Setting up your operations here enables you to manage distribution across multiple time zones and languages. Situated in the GMT time zone, facilitates working with both western and eastern markets during a single working day. Nearly all European capitals are less than three hours away and serviced by frequent low-cost flights. This access to the Eurozone and the easy access to European cities from Irish airports has proved a very attractive proposition for those looking at Ireland for FDI purposes. A recent economic report by the Arab-Irish Chamber of Commerce forecasts that Irish exports to the Arab markets have the potential to reach €9 billion over the next two decades. It’s little wonder then that travel from Ireland to the middle-east has increased in the last decade. Direct flights of less than eight hours now offer easy access to all the major Middle Eastern business hubs. In June, both Cathay Pacific and Hainan Airlines started direct flights to Dublin from Hong Kong, and Beijing respectively. This represents 1,700 airline seats each week from the Asia Pacific region to Ireland. Trade between Ireland and China is growing each year, currently estimated to be worth more than €14.9 billion per annum. The country’s motorway network serves as an excellent example of Ireland’s excellent domestic infrastructure. According to the government’s Transport Trends report, Ireland now has almost 1,000 kilometres of motorway, a figure that grows yearly. This enabled a record 141.7 million tonnes of freight to be transported by road last year. While this does not seem like a significant amount of motorway, you must remember that Ireland is 185 km (114.9 miles) wide and 404 km (251 miles) long. Regardless of where you are in the country you will always be less than 100kms (63 miles) from the coast. The recent announcement that the M20 Cork – Limerick motorway, included in the government’s 10-year capital plan, has been widely welcomed. It will help promote the Atlantic Corridor as a business location stretching from Cork to Galway and further north. The ability to locate in both urban and rural areas – each served by advanced transport and technology infrastructure – has been a key selling point for business decision makers choosing Ireland as a location for their European base. It goes without saying that as an EEA or Swiss national you are entitled to come and work in Ireland either as an employee or a self-employed person — you do not need permission to establish a business in Ireland nor do you require a visa to visit. If you are a non-EEA national who wishes to travel to Ireland on business for a short period of time, then you will require a ‘C’ class visa. This enables you to stay in the country for up to 90 days for business or for work that lasts 14 days or less, subject to various conditions. To remain in Ireland on a more permanent basis, investors can avail of Ireland’s Immigrant Investor Programme (IIP). The scheme enables non-EEA nationals (and their families) who commit to an approved investment in Ireland to acquire permanent residency in the country. A minimum investment of €1 million is necessary, from the applicant’s own resources and not financed through a loan or other such facility. The investment must be committed for a minimum of three years. Enterprise Investment: A minimum €1 million aggregate investment into new or existing Irish businesses for a minimum of 3 years. Investment Fund: A minimum of €1 million investment in an investment fund for at least 3 years. Real Estate Investment Trust (REIT): A minimum investment of €2 million in any Irish REIT listed on the Irish Stock Exchange. A 12-month immigration permission is available for foreign national entrepreneurs preparing a STEP application. This includes attending incubators or innovation bootcamps in Ireland. The future of Ireland’s trading relationship with the UK is proving to be a challenge in the Brexit negotiations. According to figures from the CSO, 85% of Ireland's total EU freight trade goes via British ports. This has prompted exporters to look at other options including cutting out the so-called ‘UK land bridge’. Direct sea routes from Dublin to the Dutch port of Rotterdam, and to Zeebrugge in Belgium have been introduced with extra freight capacity is also planned on routes between Dublin and Cherbourg, and the Cork to Santander routes. Would you like to find out more about what Ireland and Smart MBS has to offer?